Ah, the 'difficult second album' - one of pop's truest clichÃƒÂ©s. 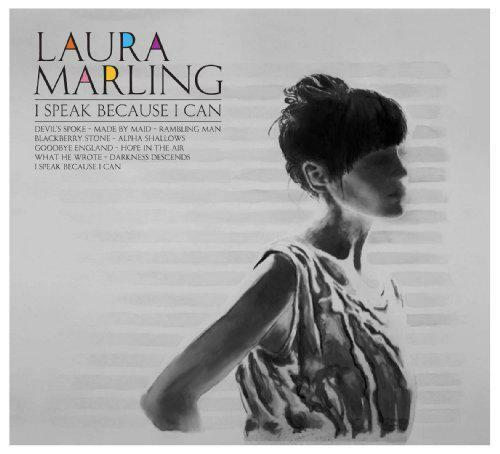 Laura Marling's first, 2008's Alas I Cannot Swim was strikingly precocious for someone who was just 18-years-old upon its release, and it was duly garlanded with lavish praise and a Mercury Prize nomination. It was a pretty and occasionally playful record, but more often it was politely dull. Since its release, she has split up with boyfriend Charlie Fink, of twee folk-popsters Noah and the Whale (who chronicled the breakup on their mopey, indescribably tedious whingefest of an album, The First Days of Spring), and the effects of this event are apparent on I Speak Because I Can. Yes, it's a more 'mature' work (Ã‚Â©: every single music reviewer in the world) which deals with 'darker themes' than her debut, yet still sees hope and optimism in the world. I apologise for the sarcasm, but Marling is such an easy target: ISBIC is, for much of its running time, such a glum and po-faced record. That said, it marks a progression from her debut, as there is a handful of enjoyable, nicely written and, yes, mature songs here. You just have to wade through a morass of morose acoustic balladry to get to them. The first three songs all impress, in different ways. Opener 'Devil's Spoke' is an effective, brooding slice of folk-rock, powered by brisk acoustic guitars and a jaunty double bass (provided, unfortunately, by dreadful indie-folk bumpkins Mumford and Sons, one of whom is Marling's latest beau). It's followed by 'Made by Maid', which is gentle and exquisitely pretty and sounds just like Nick Drake. Marling becomes Joni Mitchell on the next rack, the gorgeous 'Rambling Man', and despite the opening lament of "Oh, naÃƒÂ¯ve little me," she soon finds some resolve: "If I sit here and weep/ I'll be blown over by the slightest of breezes." After this promising start, things sadly take a turn towards the dreary, the sullen and the self-obsessed. 'Blackberry Stone' is bearable but boring; worse is the dark, depressing and unpleasantly rootsy 'Alpha Shallows'. 'Goodbye England(Covered in Snow)' is cleverly written, but too sentimental for this listener's taste: I can already picture the closing scenes of soppy ITV dramas that it will be soundtracking in six months' time. 'What He Wrote' is marked by some irritatingly mannered singing and a kind of trad-folk pseudo mysticism: "Begged him to stay, by the light of my ship/ Me fighting him, fighting light, fighting dawn/ The waves came and stole him and took him toward." This kind of thing would be more bearable with a hint of irony or a darkly comic twist, but as it is it sounds painfully baroque and deeply unoriginal. Things pick up towards the end of the album, especially on the excellent title track, but by then the damage is done and you may well have found yourself bored by the mid-section's relentless dreariness and self-importance. Marling's lyrics contain some striking turns of phrase, but her sole subject is herself (every song is in the first person) and, skilful writer though she is, there are probably limits to your interest in her trials and tribulations. She occasionally finds a little spirit - "I forgave your shortcomings and ignored your childish behaviour," she chides an ex on 'Hope in the Air' - but much of the record feels like one long sigh. It's a shame because there are some very good songs here, and it's easy to see why critics adore Marling: she's young, she's attractive, and she's got some talent. She just needs to dump the Mumfords, get out more and lighten up a bit. 'Dump the Mumfords' Couldn't have put it better myself.